Hearthstone‘s Blackrock Mountain expansion keeps drawing closer and more new cards continue to pour out. This time around, we have more neutral cards, the second new Mage card, and even a new legendary. Before we start, these reveals have brought up something strange as it appears that the expansion won’t include any new epic cards. Mapping out all of the cards that have been revealed and the remaining legendary and class cards, there is not enough room left in the 31 card set to include any epics. There are 18 class cards (all commons and rares), 6 neutral commons, 2 neutral rares, and 5 legendaries. That fills out the entire span of new cards without a single epic able to fit. It’s a bizarre omission, but any rarity lower than legendary is really only relevant in arena, so it’s not a great loss. With that out of the way, let’s get into the cards that will actually be added. 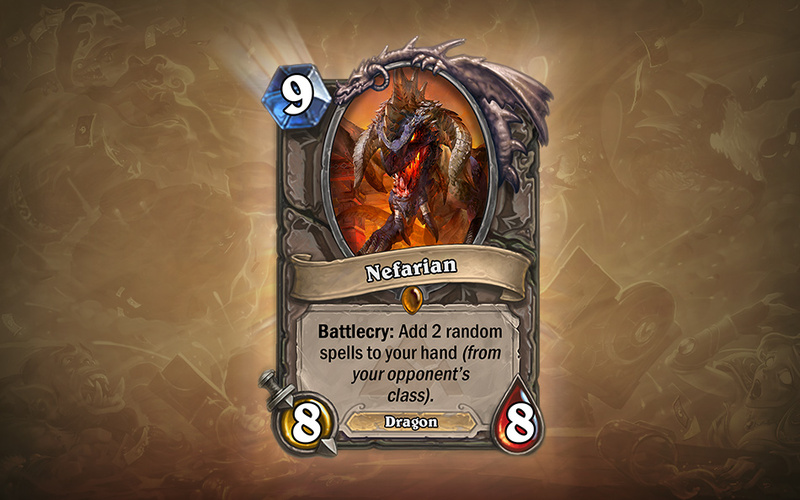 First, we have a new legendary with Nefarian (pictured above). Given that Nefarian is the main antagonist of the new adventure, this will likely be the final card to be obtained in Blackrock. Nefarian is a bizarre yet potent minion that gives you two random spells from your opponent’s class. These won’t necessarily be spells that your opponent is running, but any spells that the class has available. There is undoubtedly a great deal of randomness involved and you may end up with worthless spells. On the other hand, an 8/8 stat line is pretty durable and fearsome. On the OTHER other hand, 9 mana is a big investment that will take up your entire turn and will leave you vulnerable if you aren’t already ahead or at least stable. Even the spells you acquire will have to wait until the next turn to be played unless they’re extremely cheap (and if they are, they’re not going to do much). Nefarian is an okay card that will surely see some experimentation, but probably won’t become too frequent in the long term. 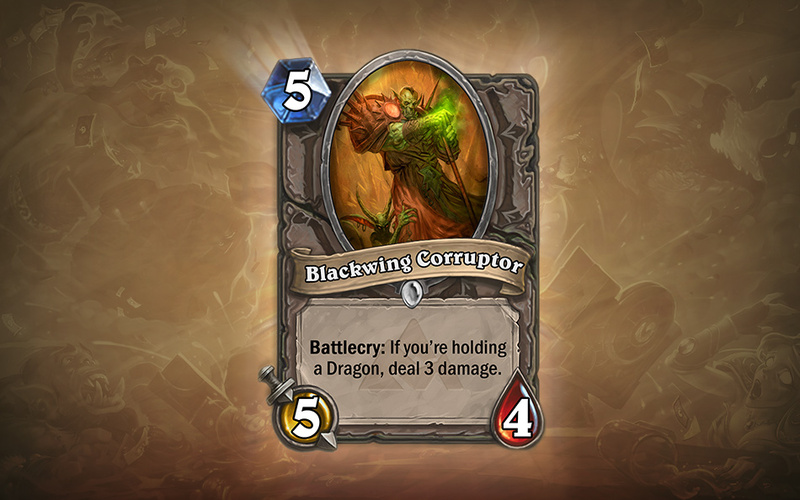 Next up is Blackwing Corruptor, who carries a less than stellar stat line as a 5/4 for 5 mana. However, he might be able to make up for it with his battlecry. In a new bit of dragon synergy, Corruptor can deal 3 damage if your holding a dragon. Many have jumped to calling this a worst version of the Fire Elemental card, but the Elemental can only be used in Shaman decks while Corruptor is class neutral. 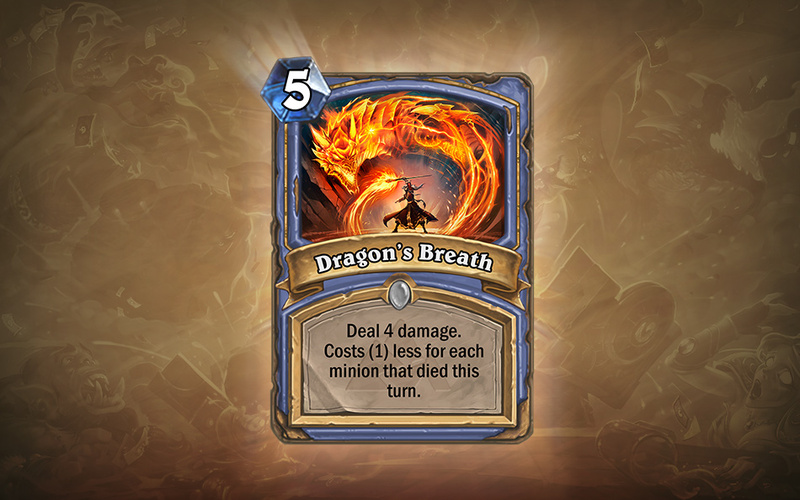 While dragon synergy will limit the number of decks that this card can work in, it’s certainly a good card that’s worth keeping an eye on. Here is the second and last new Mage card that we’ll be seeing in Blackrock and, unfortunately, it’s nothing to get excited over. We’ve seen cards with flexible mana costs before, but sacrificing minions for cheap spell damage is only worthwhile if you’re running a token deck. This could have had potential for Druids, Paladins, Hunters, or Warlocks, but they instead opted to give it to Mage, a class not exactly known for throwing out expendable minions. What Mage is known for is having Fireball, a more powerful and reliable spell than this could hope to be. The idea is that this can help clean up survivors after casting Flamestrike, but it’s too situational to be viable. Don’t expect this card to show up too often. 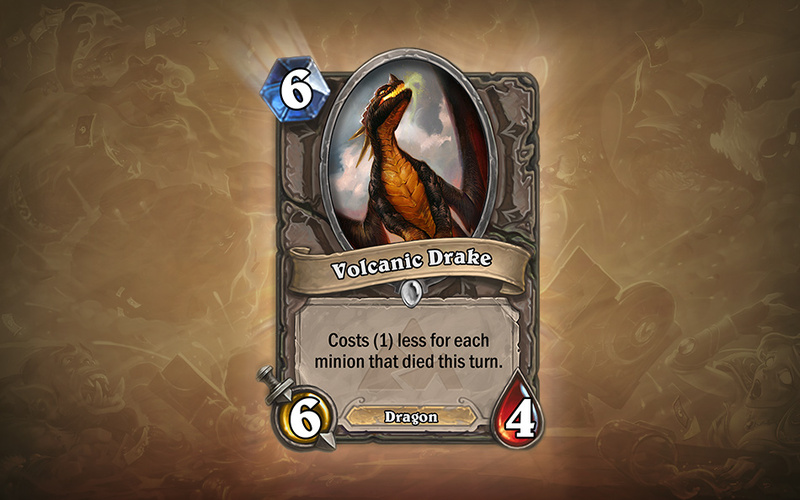 Volcanic Drake is like Dragon’s Breath, but remotely decent! Given that it’s a neutral minion, it can be much more flexible and much less situational. Unfortunately, it’s still not that good as a 6/4 stat line is fairly weak. This could be viable as mid-game muscle in Zoolock and various token decks as a good option for bringing down tough targets or just smacking the enemy hero. Otherwise, it won’t go far. 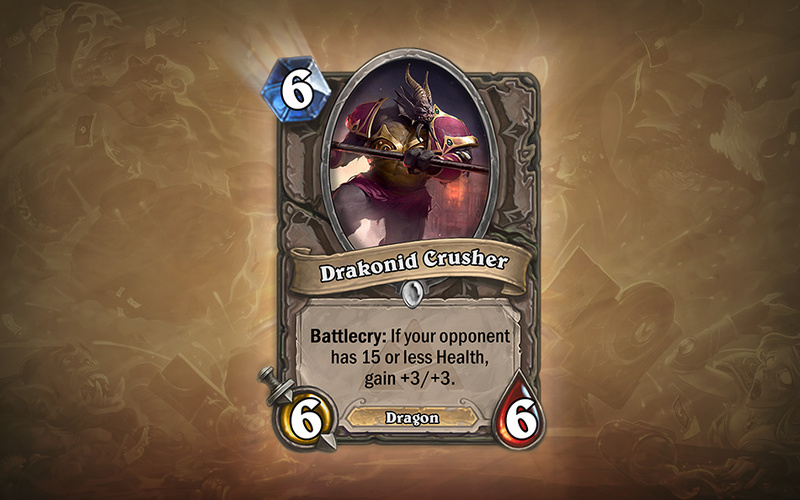 Finally, we have the Drakonid Crusher, a minion similar to the Core Rager which should be a red flag right away. Getting a cheap 9/9 when your opponent is low on health sounds great as a finisher, but there’s the issue of getting your opponent that low to begin with. That’s easiest in aggressive decks, but huge bodies aren’t too useful in those types of decks. They’re more handy in control-focused decks which focus more on the board than the enemy hero. The biggest problem with the Drakonid Crusher is that he doesn’t really have a deck to call home when it comes to constructed play. He can at least say that he’s much better than Fel Reaver and Anima Golem and will likely see most action in the arena where it can be beastly. Which cards are you most excited to get a hold of? Are you disappointed by the apparent lack of epics in Blackrock? Leave a comment below and let us know what you think. UPDATE: Blizzard has officially announced the release date for the first wing. Blackrock Depths will release in the Americas on April 2nd and in Europe, South Korea, Taiwan, China, Southeast Asia, and Oceania on April 3rd.